In a large pot, melt the butter over medium heat. Once it foams, add the orzo and cook until golden, 2 minutes. Stir in the rice; season. Add 2 1/2 cups stock, the cranberries, scallion whites, orange zest, rosemary and bay leaf. Bring to a boil, then cover, reduce heat to low and cook until the rice is tender, 17-18 minutes, adding the remaining 1/2 cup stock, if needed. Discard the bay leaf. In Recipes-list.com we have selected the most viewed recipes from category - uncategorized . Enjoy the best recipes specially selected for you! 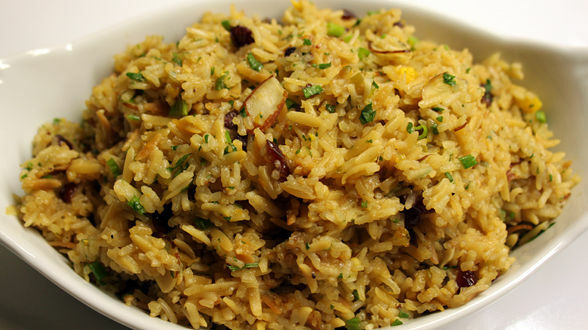 Almond-Cranberry-Orange Rice Pilaf is the right choice that will satisfy all your claims.